As Nicholas Temperley remarks in his notes, the Loders of Bath were a distinguished family of professional musicians. 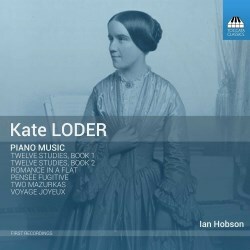 Toccata has already released a disc devoted to the music of Edward (1809-1865), the son of the prodigy John David Loder (TOCC0322) and now it’s the turn of John’s niece, Kate. She went to the Royal Academy of Music at the age of thirteen, studying the piano assiduously but also taking composition lessons from Macfarren and Cipriani Potter. She began an admired career as a professional soloist but marriage brought an end to all that and her final concert came in 1854 with a performance of one of her warhorses, Mendelssohn’s D minor Concerto. Withdrawing from an active performing career didn’t impede her writing music. She wrote two sets of twelve studies in the years 1852-53 and they form the backbone of this release of first-ever recordings. The first set is slighter than the second but both have many felicitous touches and many opportunities to gauge her approach to the mechanics - but also the expressive potential - of the Etude. The earlier studies are largely pragmatic, with limited chances for freedom – they are certainly not the kind of thing turned out by Czerny, for example. But Book 1 makes some real demands on technique showing, in passing, that her own technique must have been highly developed. She makes a constant demand on the play of hands, with melodic interest retained in the right hand but as this first set develops she shows signs of the influence of Field and Chopin, not least in those more romantic or nocturne-like elements that pervade the music. This is a feature that is more explicit in the second book where there is nevertheless a similar sense of confidence, purpose and adroitness. She can move from the Fourth in A minor with its vivid thirds and sixths to the ensuing Fifth Study which requires earnest romanticism and quite large stretches. The eighth study is rather witty and its successor owes Mendelssohn a debt for its Song without Words quality. The final three studies of the second book are especially fine, stormy, Chopinesque and attractive examples of the genre. A handful of other previously unrecorded pieces close the bill of fare. Mendelssohn, once again, haunts the charming Romance in A flat, there’s a refined Field-like Pensée Fugitive and a songful Voyage Joyeux. There’s a gap of around three decades to the last two pieces, Mazurkas written between 1895-99. The A minor is especially revealing in its rather clotted and much more indeterminate harmonies; a late work indeed. Ian Hobson plays with great assurance, neither seeking to inflate the rhetoric nor to downplay the clear influences on her of her eminent contemporaries. A finely judged recording balance completes a disc that shines renewed and welcome light on one of Britain’s unjustly overlooked musical families.